It's Sofia's bunny party day! It may seem strange to share the favors before the actual party, but I thought in case anyone was looking for some very last-minute inspiration, I should share these today. I found some very gaudy baskets at the dollar store, 2 for 1$. They did not match the party colors at all, so I sprayed them a bubble-gum pink instead. I used Mama Elephant's sketchy letters to stamp and adhere a personalized banner to each basket. 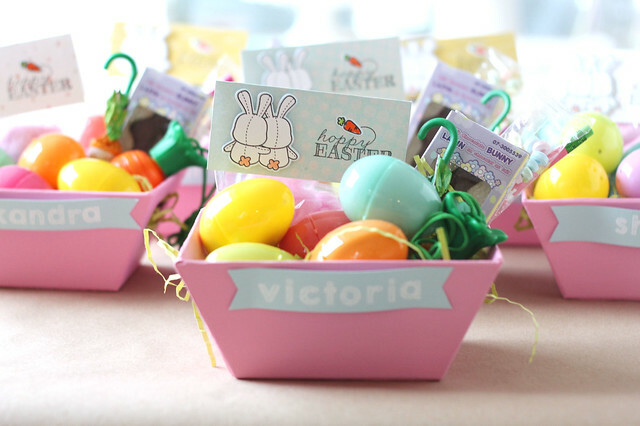 Inside, I started with a base of crinkly basket filler in spring colors, and filled the basket with fun, Eastery treats. 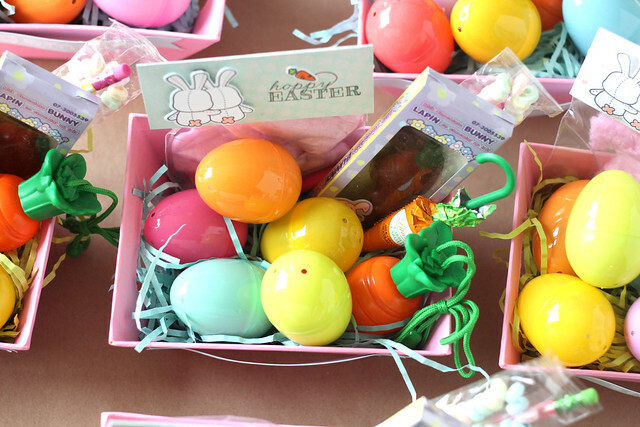 Inside each egg, are little chocolates, some nail polish and a soft, girly headband. 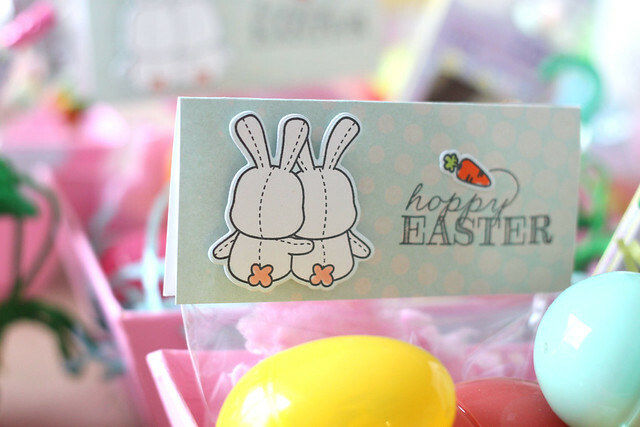 Since Sofia's party is the day before Easter, we settled on the sentiment "hoppy easter" inside of a thank you. The bunny bums were appropriate for the end of the party, we both thought. hee. I hope you like them! We're all set to greet Sofia's friends this afternoon, and I'll scramble to share it all with you bright and early tomorrow morning - I'd love if you had time to pop back over here tomorrow! I can't wait to see everything! I love seeing the parties you put together! You really are a super mom! Hoping that the party goes smoothly (although I already know that it will). Have a great time! Great idea to paint the boxes, probably less expensive than looking for the pink you need and then paying double if not triple the price. I can't wait to see the photos of this amazing party!! What a fantastic ensemble, I agree you are a great mom! Great favors! Love this idea.